Try teaming a red lace party dress with a white quilted leather crossbody bag, if you enjoy comfort dressing but would also like to look stylish. To give your overall look a sleeker aesthetic, why not introduce a pair of red leather pumps to the mix? A black crochet sleeveless top and a Givenchy white quilted leather crossbody bag paired together are a total eye candy for those who prefer cool chic combinations. If you wish to immediately perk up this look with a pair of shoes, why not add a pair of orange suede wedge sandals to your outfit? 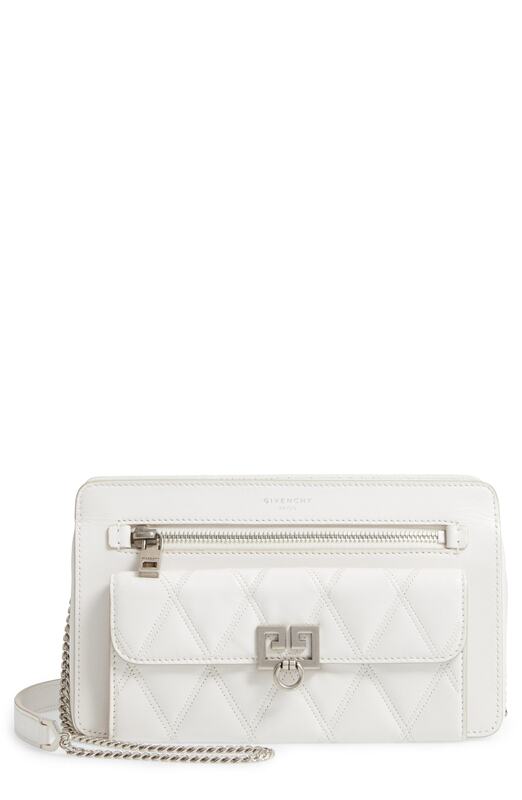 If you're all about being comfortable when it comes to picking out an outfit, this pairing of a white fur jacket and a Givenchy white quilted leather crossbody bag will totally vibe with you. Blue satin heeled sandals will easily smarten up even the simplest look. Try teaming a grey coat with a Givenchy Quilted Pocket Leather Crossbody Bag from Nordstrom for a casual ensemble with a modern twist. Tan suede ankle boots will bring an added touch of style to an otherwise mostly dressed-down look. Choose a grey cable sweater and a Givenchy Quilted Pocket Leather Crossbody Bag from Nordstrom to be both trendy and comfortable. Want to dress it up on the shoe front? Complete your look with white heeled sandals. If it's ease and functionality that you're looking for in an ensemble, choose a red polka dot maxi dress and a Givenchy Quilted Pocket Leather Crossbody Bag. If you need to effortlesslly perk up your look with footwear, slip into a pair of beige leather heeled sandals. A white fur jacket and a Givenchy Quilted Pocket Leather Crossbody Bag are the ideal way to introduce effortless cool into your off-duty routine. And if you need to immediately up the style ante of your look with shoes, why not introduce a pair of black suede over the knee boots to the equation? This casual pairing of a grey sweater dress and a white quilted leather crossbody bag is super easy to pull together without a second thought, helping you look chic and prepared for anything without spending too much time rummaging through your closet. For a trendy mix, add a pair of black suede over the knee boots to your look. For To achieve a casual look with a twist, rock a pink off shoulder dress with a white quilted leather crossbody bag. Beige leather pumps are guaranteed to infuse a hint of sophistication into this outfit.